Some nights I just want to sit down on the couch, turn my favorite TV show on, and indulge in some good old comfort food. Whether it's because I'm in a funk or simply because I'm craving something warm and cheesy. Is it just me or does cheese just scream comfort? Last night was one of those nights and I was craving pasta, but I didn't want all the guilt that went along with it. 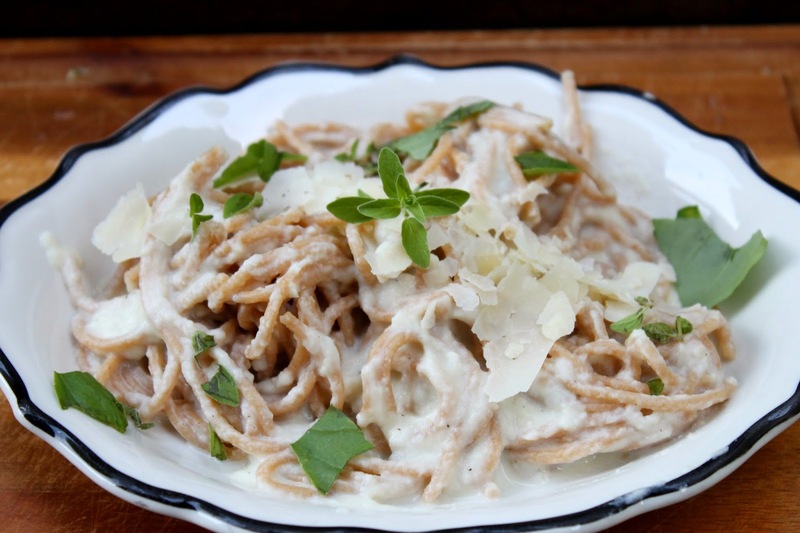 So I boiled some whole wheat spaghetti and whipped up a skinny roasted garlic alfredo sauce to go along with it. That's right, I said skinny alfredo. 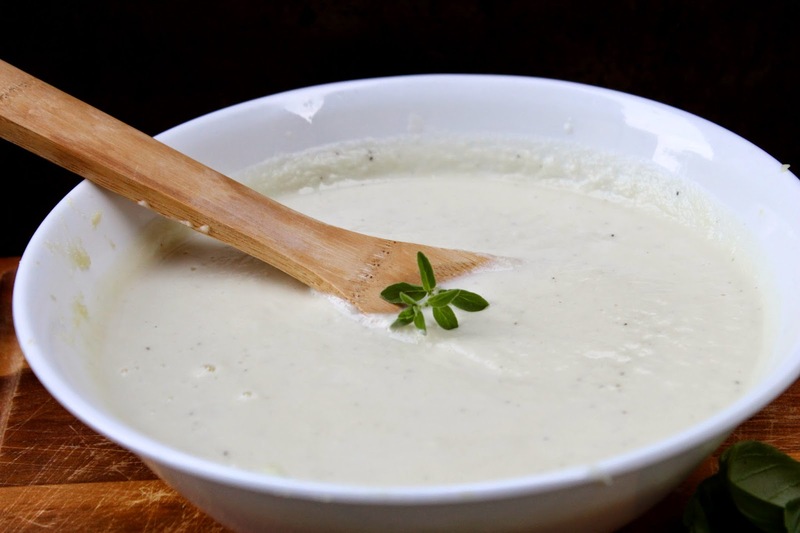 Rather than loading up on a bunch of heavy cream and butter I use cauliflower to make a deliciously smooth and creamy sauce. 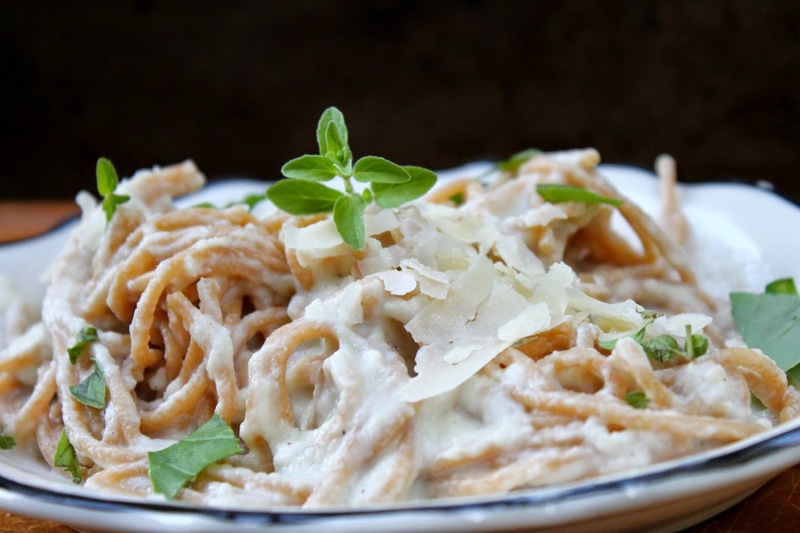 There's only a little bit of butter in this dish, because really, what's alfredo without a little bit of butter? Start by preheating the oven to 400 degrees. 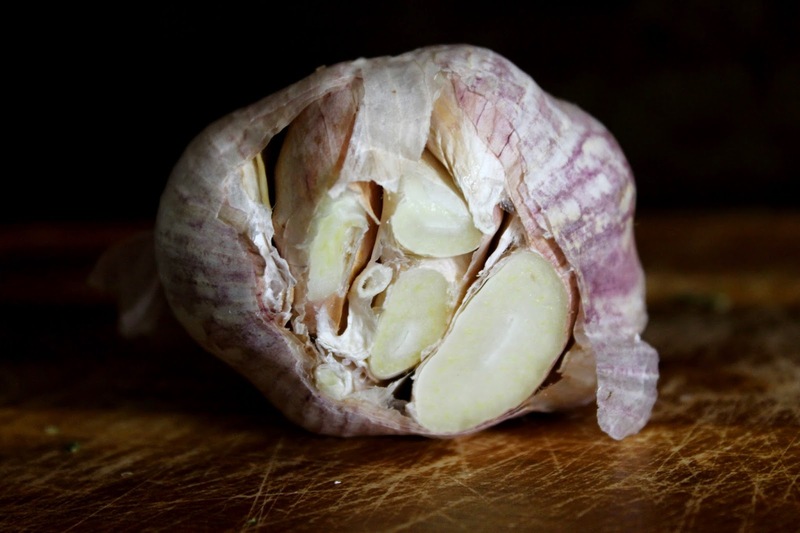 Then cut the top of the head of garlic off (1/4 - 1/2 inch), so that each individual clove is revealed. Drizzle on the olive oil and finish by sprinkling with salt. 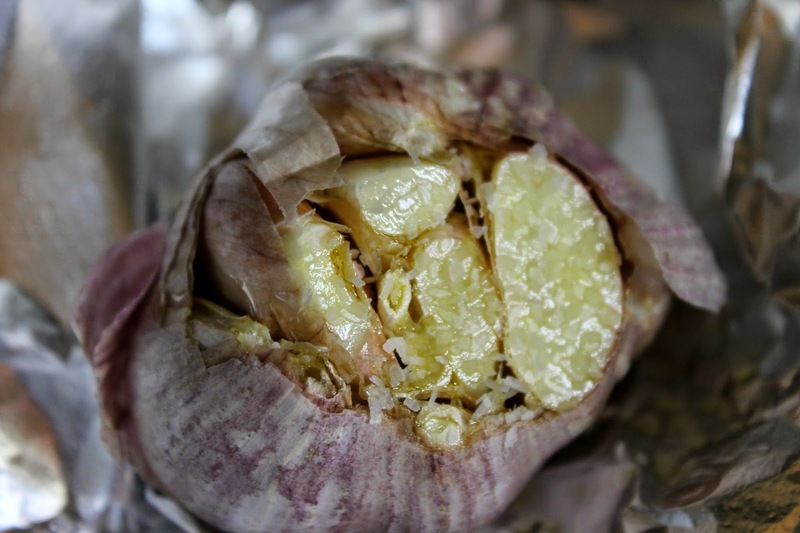 Cover the entire head of garlic in the foil and place in the preheated oven for 30-35 minutes. Cook until the garlic cloves are soft to the touch. 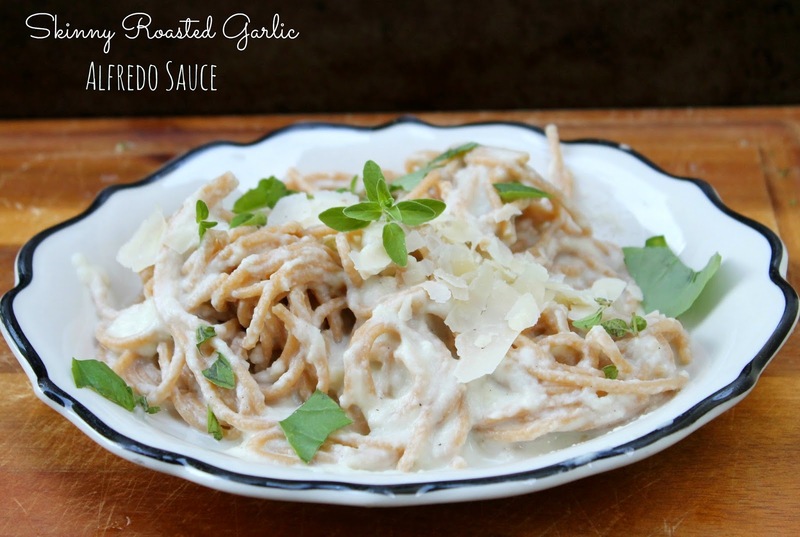 While the garlic is roasting start your alfredo sauce. 3. Once the cauliflower is ready transfer it along with the remaining vegetable broth into a food processor or blender. Then add the parmesan cheese, fat free half & half, milk, salt & pepper. 4. Check the garlic, if it's ready push out all the cloves (be careful, the head of garlic will be very hot) and add it to the blender. Blitz the sauce for another minute or so to ensure all the ingredients are well incorporated and as smooth and creamy as possible. I didn't have any protein, otherwise I would have added some shrimp to this dish. However, fresh herbs from my garden were a refreshing and welcomed addition. 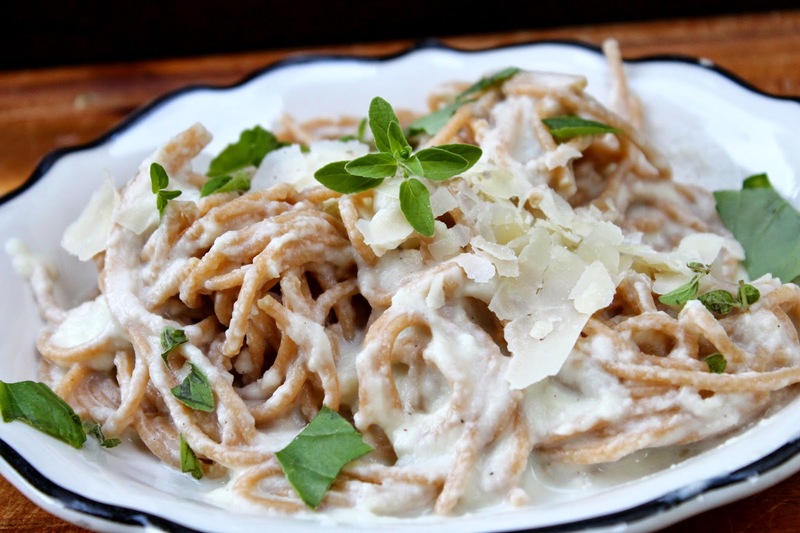 What do you think, would you try this skinny alfredo sauce? If so, would you top it with shrimp or chicken? I have a helpful suggestion that hopefully will push you away from the fat-free half and half. The reasons to avoid this ingredient in an otherwise healthful dish can be found on its ingredients label. 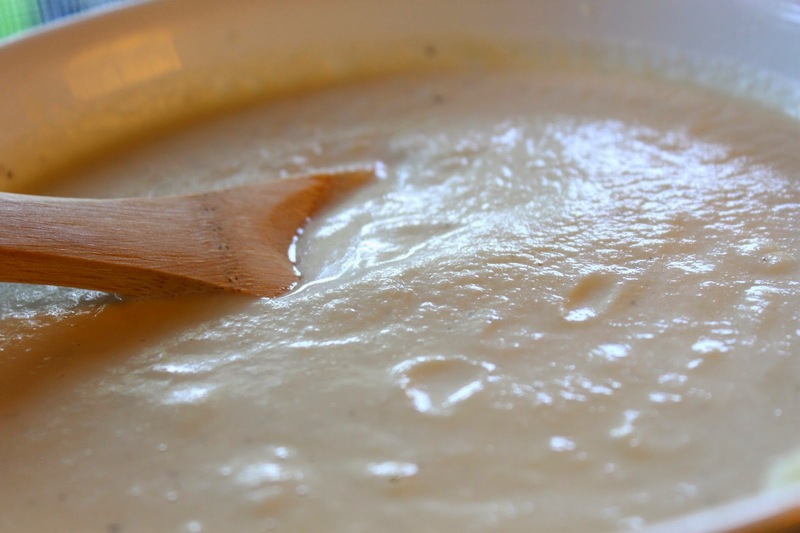 If you are already using real butter, perhaps consider making the sauce thick and creamy by making a blonde roux. Then you can add your fluid dairy (I'd probably go low-fat vs. fat free, but either would work). From there, adding in the veg puree and roasted garlic sound delicious. But an Alfredo sauce it is not. P.S. That dish has plenty of protein as it is. The whole grain pasta has protein, the milk has protein, the cheese has protein, the butter has protein, and even the cauliflower has protein. Add 'em up. Unless you are lifting weights and trying to build muscle, you should be golden. Thanks for the tip, Daniel. I'll try the blonde roux next time I make this dish.